Formartine United have continued their summer activity in the transfer market with another three signings. Brora Rangers defender Craig McKeown has returned to North Lodge and also joining up are former Montrose defender Jonny Crawford and ex-Dundee United keeper Phil Anderson. It brings Kris Hunter’s signing spree to six since the end of the season. Meanwhile, former Formartine United defender Ross Campbell dismissed any signs of loyalty towards his old club when he scored Westhill Amateur’s first goal in the final of the Hans Fyfe Trophy against Formartine United Amateurs last Wednesday. 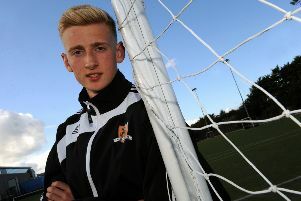 Campbell played for the United senior side collecting an Aberdeenshire Cup winner’s medal along the way before returning to the amateur ranks. Westhill ran out 2-0 winners in the end with Formartine having to settle for the Division Championship title and promotion for their efforts.